Maybe I don’t know where to look for spicy food in Europe, or maybe my idea of spicy differs from the palate here, but I’ve noticed that there’s a decided lack of spicy heat on this side of the pond. I haven’t turned into one of those spice monsters that travel around with ghost chilli pepper flakes in their pocket, but I do appreciate that tingly burn you get when digging in to a perfectly spicy dish. 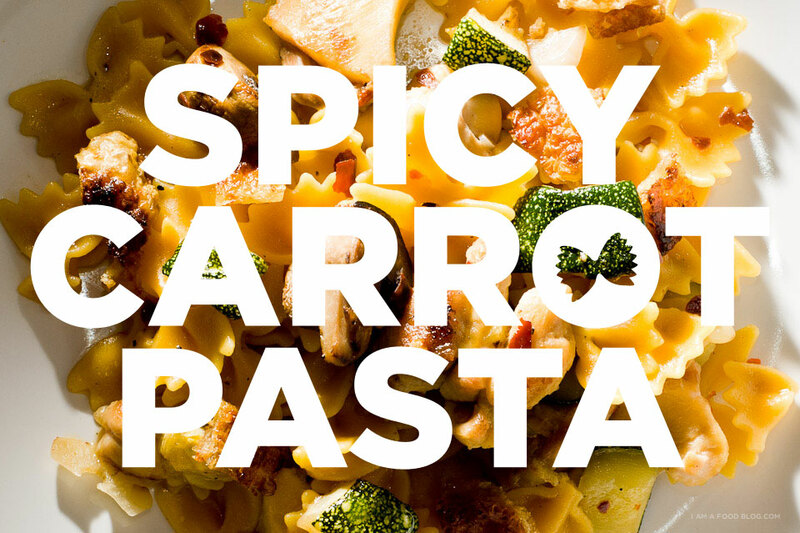 After nearly 3 months of travelling across Europe and many, many meals out, Mike and I were definitely feeling the spice craving so one night I threw together a simple spicy chicken carrot pasta. It was fast, easy and totally hit the spot. It was basically a dressed up aglio e olio, one of my go-to dishes when I’m looking for something quick and satisfying. Aglio e olio is super simple: just pasta, garlic, and red chilli flakes. Generally, crushed red chilli flakes aren’t very spicy, but when you throw them in by the handful like I do, they can pack a much needed spicy punch. For an extra bit of indulgence, I made some crispy chicken cracklings. The little bits of crispiness were the perfect bit of crunch for this dressed up aglio e olio. 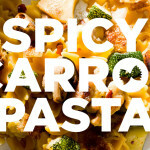 i am hearty, i am spicy: i am carrot and chicken pasta! Remove the skin from the chicken leg and lay it as flat as possible in a small frying pan. Turn the heat to medium-low and cook slowly. The fat will render out slowly and the skin will start to turn golden brown and crisp. It’ll take about 20 minutes, depending how high you turn up the heat. If the skins are drowning in fat, feel free to siphon off some of the fat to save or discard. Flip halfway through cooking. When the skin is deeply browned, remove from the pan and drain on paper towels and season with salt and pepper. Crumble or chop into small pieces and set aside. Cook your pasta according to the package instructions. While the pasta is cooking, heat up the olive oil in a large deep sided skillet. Add the garlic and stir for about a minute. Add the red pepper flakes and then turn the heat up to medium-high and add the chicken pieces and cook, undisturbed for 2-3 minutes, or until a delicious golden brown crust starts to form. Flip and brown the other side, another 3 minutes or so. Add the zucchini and mushrooms and cook until softened. Check that the chicken is cooked through. By now your pasta should be cooked. Drain, but reserve some of the cooking liquid. 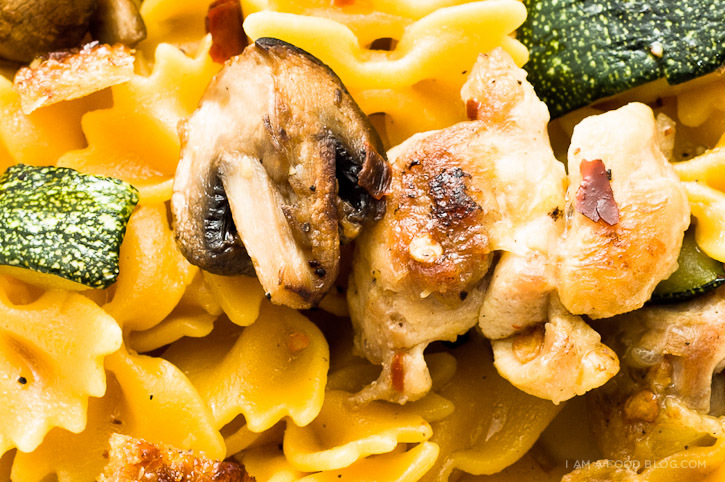 Toss the hot pasta into your large skillet with the chicken and vegetables. Stir to combine, add a bit of the reserved cooking liquid, and season to taste with salt and pepper. 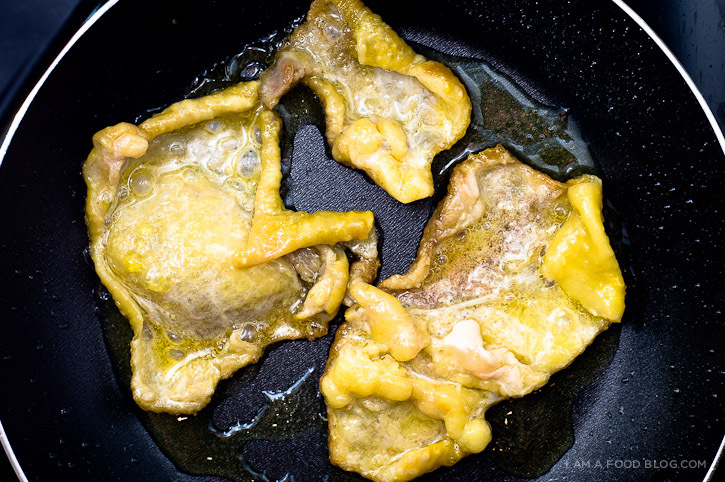 Serve hot with bits of crispy chicken skin on top. 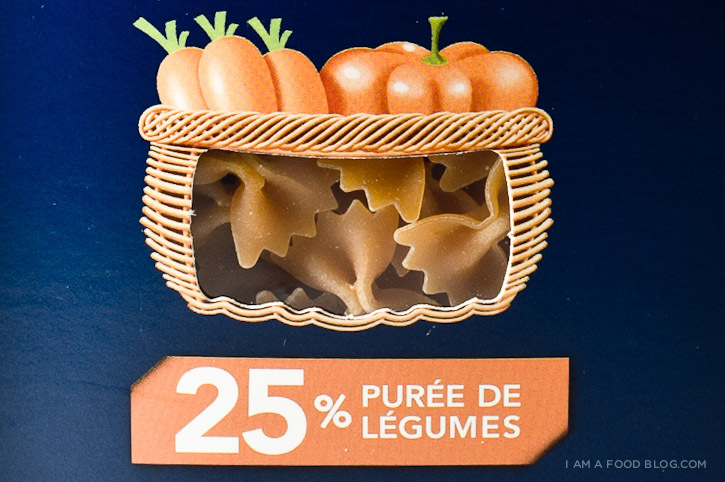 I found this awesome mini carrot farfalle at a Monoprix in Bordeaux and I could not resist it. Is anyone else obsessed with visiting grocery stores while traveling? OH my my my. The crispy chicken skin? Thats where it’s at. This sounds so yummy! 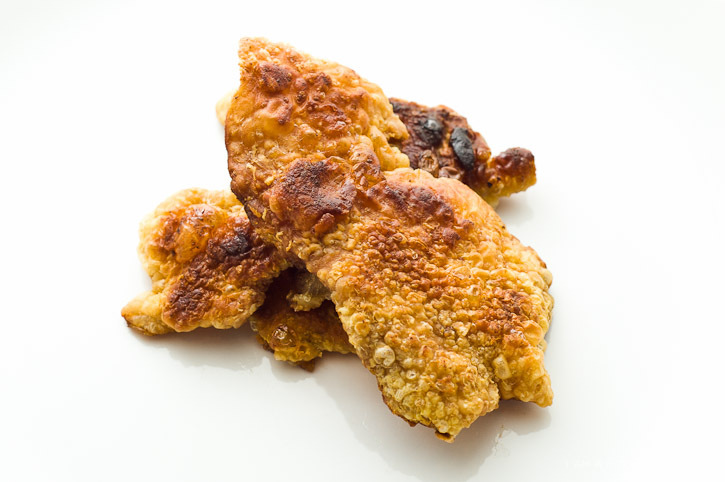 I love spicy dishes…and YES to crispy chicken skin. Oh my. 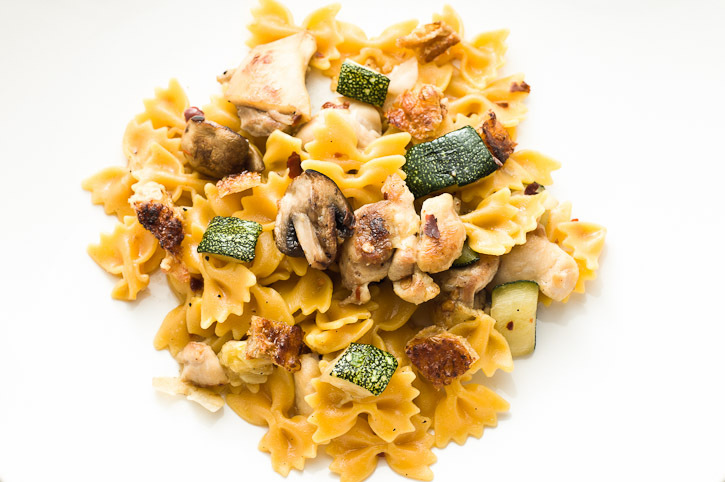 Zucchini and mushrooms are a favorite combination at my house, not to mention spicy pasta dishes. I’m a bit confused as to where the carrots are? 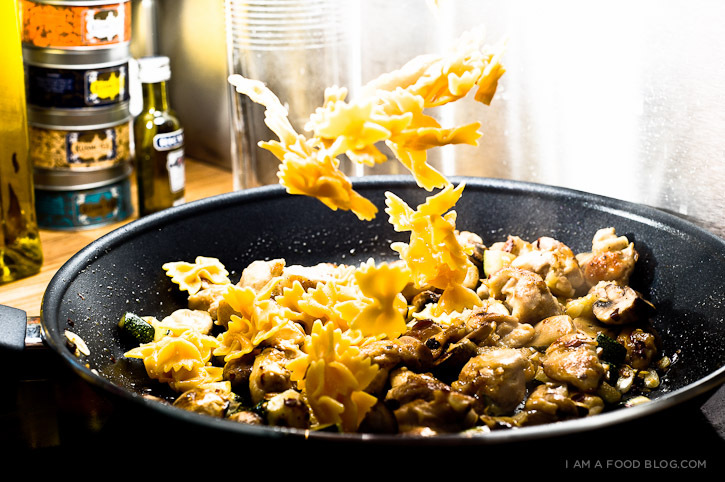 Are you referring to those in the farfalle? I ask because a slightly sweet bite from carrots would probably go very well with this. We LOVE a bit of spice…and this sounds particularly comforting and delicious! And that crispy confit chicken skin….WOW! Love the inspiration for CRISPY CONFIT CHICKEN SKIN! Yes! I am so obsessed with visiting not only grocery stores when we travel but also the specialty markets. I travel with my silver Airstream trailer which allows me many opportunities to visit some really amazing markets. We just got back from a big road trip through Idaho, Montana and Wyoming. Along the way we stopped in Jackson, WY and there was the most amazing market ever. It’s called the Aspens. I think I took a bazillion pictures of everything inside. By the way I adore your blog — straight and to the point with fantastic photography. Keep it up! Whenever I travel I ALWAYS checkout their “supermarkets” and farmers market whenever possible. How would you make this vegan friendly? I feel like the chicken bits really give it some extra flavor. you could do some crispy mushrooms!